A white sofa can be one of the biggest challenges for an upholstery cleaner. I know several professional upholstery cleaners that refuse to clean white upholstered furniture. I can understand that. All things considered white upholstery is very difficult to get clean and some white furniture can be damaged by a wet cleaning. At Chem-dry of Tampa FL we hate to walk away from a challenge. We clean white upholstery on a daily basis. It does present several challenges but some also some pretty amazing rewards. So how do you clean a white sofa? the best answer is quickly. Once the sofa is cleaned fast drying the furniture is the most important aspect of a safe cleaning. The longer a sofa is wet the more likely it will be damaged. 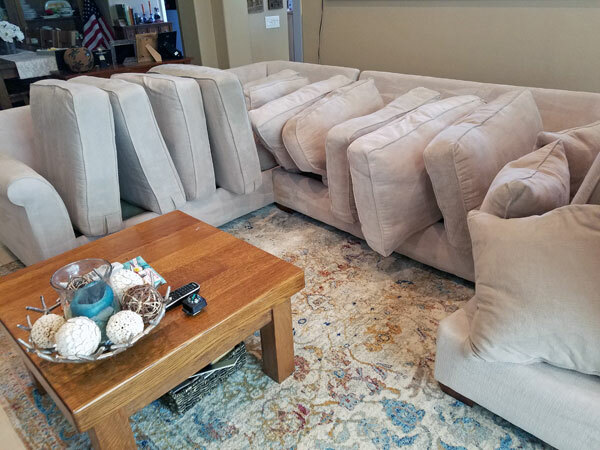 We clean white sofas as fast as possible with a two man team to make sure everything is done as rapidly as possibly. IN Tampa FL we have a lot of humidity and that can slow the dry time down. So, after each part of the sofa is cleaned we direct a high velocity air mover toward it to speed up the drying times. In most cases furniture is dry or almost completely dry be the time we pack up and leave. Cleaning a white sofa should be done by a professional upholstery cleaner who has experience in cleaning difficult or delicate furniture. I would not recommend wet cleaning furniture on your own as there are too many variables to account for in the cleaning process. For professional upholstery cleaning in Tampa FL call Chem-Dry of Tampa.